The University of Newcastle’s Coal River Working Party recently submitted a nomination for Newcastle’s Coal River (Mulubinba) & Government Domain for assessment by the Australian Heritage Council. The rejection letter(s) were incorrectly addressed twice and we are very disappointed with the decision not to include Newcastle, that, as explained by a staff member in the Office, was due to the discretion of the outgoing Minister, The Hon. Mark Butler MP. I represent people who have diligently worked for years researching and collecting historical data for Australia’s second oldest city, with academics and community historians volunteering their time to get Newcastle’s story formally recognised by the Commonwealth of Australia through inclusion on the National Heritage List. It is very distressing for us that Newcastle has been excised from the national story, and continues to be so, apparently due to a former Minister’s whim. – Australia’s first discoveries (1791 and 1796), first export (1799) and first profit (1801) of a natural resource (i.e. coal) in this country. – Australia’s first full length autobiography and dictionary compiled by James Hardy Vaux in 1811-1814. – First systematic study of an Aboriginal language anywhere in the country by Biraban, Chief of the Newcastle Tribe (now known as the Awabakal) and the Reverend Lancelot Threlkeld. This work forms the basis of many reconstructions of Aboriginal languages up and down the East Coast and elsewhere. – Australia’s “Cultural Capital” during the Macquarie era from 1810 to 1821 that led to the creation of artistic objects and works of world significance such as the Macquarie Chest, Wallis Album, Skottowe manuscript, notable engravings and paintings. – Australia’s first Industrial School for Girls, and later, the first hospital for the insane. – The important transitions in Australia’s journey to nationhood; from government industry to private enterprise, from convict to free labour, from punishment to profit, from a natural to a human-fashioned landscape. The landscape tells these stories in a dramatic fashion; through its changing landforms shaped by the demands of industry, through its archaeological remains intact and in situ, and through the continued and inescapable presence of a bustling working harbor. It beggars belief what further evidence was required for Newcastle to be formally recognised for its outstanding and enduring contribution the National story. 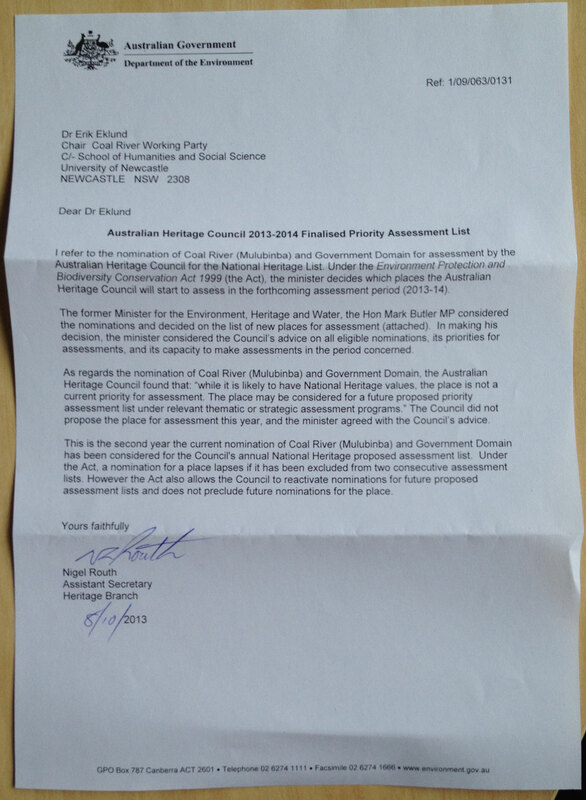 I know that this is not your fault, but I felt compelled to write to you to let you know the shortcomings of the National Heritage listing process and its frustrations on the people that do the hard work at collating and presenting the evidence to your departments. You cannot understand the history of Australia without knowing about the little places such as Newcastle. They are the hinges upon which the great doors of the nation move. Not knowing its history, is like seeing Shakespeare’s Othello, with the main character missing, the story cannot make any sense. We would deeply appreciate you investigating this matter, and letting us know what can be done to ensure that Australia’s second oldest city and its exemplary contribution to the Australian nation is formally recognized by the Commonwealth and brought back into the story of the Nation. Hi Gionni, great to see you chase up Lycett’s painting of Newcastle Harbour. The last occassion we made contact I was working for DIPNR (Aboriginal cultural landscapes project) based on foreshore near the tugboat terminal. While there I purchased a small book called Historical Records of Newcastle 1797-1897. ISBN 0 908120 19 2 Not sure if you have it but very informative. We should also catch up and exchange some info. Thanks Mick. Yes, we do have have that title, but search our Bingle’s History as well, digitised copies are available on our King Edward Park story. It predates the Ralston and Windross, and is Bingle’s eye witness testament dating from the 1820s. It was published in 1873 and should be recognised as a primary source.